It is a real delight to join you again for the City Week in this beautiful season of sweet grass and May flowers. 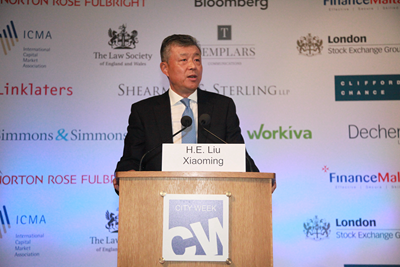 This year, the City Week focuses on "the opportunities for the financial services industry flowing from the opening of China's financial services markets and the country's global expansion." Today, I would like to share with you what I see as the "China Opportunities". Let me begin with the Belt and Road Forum for International Cooperation held in Beijing ten days ago. This international gathering attracted worldwide attention. It brought together 29 heads of state and government and 1,500 representatives from over 130 countries and 70 international organizations. Participants have been unanimously optimistic about the prospects of the Belt and Road. They hope the Belt and Road will be an opportunity to gather momentum for common development and to deliver tangible outcomes. If you wonder why the Belt and Road Forum was highly recognized and widely supported by the international community, here are a few reasons. First, this is a summit of crucial importance because it focuses on development. The world economy has gone through a few years of sluggish growth. This has been accompanied by increasing anti-globalization and rising protectionism. Deep-rooted problems such as peace deficit, development deficit and governance deficit are calling for immediate solutions. Now is a crucial stage for world development. In face of the general trend and common challenges around the world, the fundamental question of our times is this: what is the way forward? President Xi Jinping in his keynote speech at the Belt and Road Forum offered his answer: Development is the key to all the problems we are facing in the world, and the Belt and Road Initiative offers a golden key. So the Forum, the highest level event under the Belt and Road framework, is a right summit at the right time. This Forum generates new energy for inter-connected development of all countries. It provides a new solution to fairer and more effective global governance. And it blazes a new trail for addressing the problems in global and regional growth. Second, this Forum is a summit of hope. It aims to build a shared community of mankind. As a Chinese saying goes, "Walk fast, walk alone; walk far, walk together." The Belt and Road Initiative calls on everyone to walk together and reach long-term goals. Partners in the Belt and Road Initiative will engage in win-win cooperation to achieve shared development for common prosperity. They will build peace and friendship in order to increase mutual understanding, strengthen mutual trust and foster exchanges across the board. The Belt and Road Initiative is not about outdated geo-politics. It seeks to establish a new model of win-win cooperation. The Belt and Road Initiative is not about forming a small group to upset stability. It is about creating a big family of harmonious co-existence. The Initiative is not aiming to reinvent the wheel. It does not challenge or seek to replace the existing international cooperation mechanisms. This Initiative will be a complement to the existing structure. China is ready to share its development experience with other countries. China has no intention to interfere in other countries' internal affairs, to export its own social system and model of development, or to impose its own will on others. The Belt and Road Initiative will enable us to dovetail China's development with that of the countries along the Belt and Road. It will link the Chinese Dream with the dream of the world. It will lay a foundation for the building of a community of shared future for mankind. "Creating a prosperous and peaceful community of shared future for mankind is our common aspiration". These are the words written in the Joint Communique of the Leaders Roundtable of the Belt and Road Forum. Third, this Forum is also a summit of real outcomes. The Forum made the blueprint and action plans for the international cooperation under the Belt and Road Initiative. This is a long list of deliverables. They are divided into five categories and include 76 agreements and 270 specific outcomes. And scale up financial support. China will contribute an additional 100 billion RMB to the Silk Road Fund, and encourage financial institutions to conduct overseas RMB fund business with an estimated amount of 300 billion RMB. The China Development Bank and the Export-Import Bank of China will set up special lending schemes. This will be worth 250 billion RMB equivalent and 130 billion RMB equivalent respectively. The fund will be used to support Belt and Road cooperation. China will host the China International Import Expo annually starting from 2018. China will work with the AIIB, the BRICS New Development Bank, the World Bank and other multilateral development institutions to support Belt and Road related projects. China will work with interested parties to formulate the Guiding Principles on Financing the Development of the Belt and Road. These concrete outcomes will provide strong support to the building of the Belt and Road. They will boost confidence in cooperation for common development. At the beginning of my speech, I promised to share with you what I saw as the "China Opportunities" for the British financial sector. Now, having heard so much about the Belt and Road, you may agree with me that in the Belt and Road Initiative, the British financial sector could find their first and foremost "China Opportunities". Finance is the lifeblood of modern economy. Growth will come only when the "blood" circulates smoothly. Clearly, financial integration is one of the five key elements of this initiative. Financial integration is also one of the highlights of China-UK cooperation. The Belt and Road building requires cooperation in investment and financing. It also involves a great deal of services, including correspondent banking, syndicated loan, settlement and clearing. In many countries along the Belt and Road routes, China is strongly encouraging the establishment of financial services platforms. The UK has had years of experience in international finance and boasts mature management expertise as well as close financial ties with many countries along the routes. As Belt and Road partners accelerate innovative financial cooperation with others, China and Britain can tap into the potential of financial cooperation with these countries. For China and Britain, the opportunities in the Belt and Road building are up for grabs. They will enable us to create new highlights in China-UK financial cooperation. 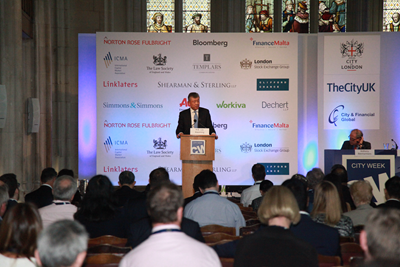 Second, the British financial sector will find opportunities in the continued opening-up of the Chinese market. ensuring quality business environment and fair and open competition. At present, a new system of open economy is taking shape in China's four pilot free-trade zones including the one in Shanghai. The State Council has also released plans for setting up seven more such free trade zones. In our opening up drive, the only way we will go is the way forward. China will open wider to the world. The business environment in China will be freer and more rule-based. China and the UK can consolidate our exchanges and cooperation in asset management, banking, capital market, insurance, old age pension and other sectors. Based on such cooperation, we can work together to play a leading role in advancing the development of green finance, FinTech, financial inclusion, and so on. Third, the British financial sector will find opportunities in the "Golden Era" of China-UK relations. This year is the 45th anniversary of the Ambassadorial ties between China and Britain. It is also a year for consolidating the "Golden Era" of China-UK relations. 45 years ago, China and Britain had zero cooperation on finance. 45 years on, China-UK financial cooperation keeps growing and deepening. China and Britain co-chaired the G20 Green Finance Study Group. At the eighth China-UK Economic and Financial Dialogue, we published the Strategic Plan for Financial Services. Last year, China's Ministry of Finance issued in London the first RMB sovereign bond worth of three billion yuan. The Bank of China issued here in UK the first green covered bonds. The ICBC Standard Bank, under the Industrial and Commercial Bank of China, acquired from Barclays a precious metals vault and related business. China Post acquired the exchange traded fund range of the Royal Bank of Scotland. Several Chinese financial institutions have set up branches in London. And London has become the largest overseas RMB centre outside China. These are the "golden fruits" of the "Golden Era". These achievements are laying the groundwork for an upgraded version of China-UK financial cooperation going forward. Fourth, the British financial sector will find opportunities in the RMB internationalization. On 1 October 2016, the IMF approved the inclusion of RMB in its SDR basket. This was a milestone. It marks a deeper integration of the Chinese economy into the global economic and financial system. China will continue to advance its financial reform, including greater opening of its capital market and a more market based RMB exchange rate. Meanwhile we will also work to ensure a steady process of RMB internationalization. The use of RMB in international trade and investment continued to increase. In 2016, the cross-border trade and investment done in RMB totaled 5.23 trillion yuan and 2.46 trillion yuan respectively. The UK as a world-leading financial services centre has always had a big and important role to play in advancing RMB internationalization. As China's market-based reforms of the exchange rate regime continues, RMB is expected to evolve from a trade currency to a quote currency and finally a reserve currency. 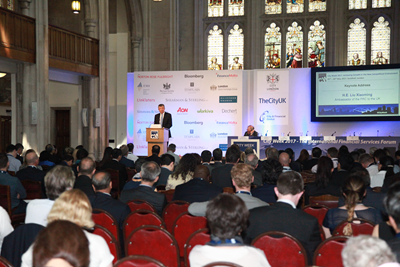 London, as a global financial centre, is expected to play an even more important role in this process. This will mean major opportunities for both China and Britain. We should seize this opportunity to speed up the building of the RMB offshore market in London. We should devote our efforts to creating more financial products and expanding financial trading. We should strengthen the links between our financial markets. We should expand our cooperation on RMB internationalization both in breadth and depth. "A pessimist is somebody who complains about the noise when opportunity knocks." The China opportunities are knocking. China and Britain have huge untapped potential and broad prospects for financial cooperation. Let us stay optimistic and open-minded. Let us commit ourselves to win-win results. And let us take actions to strengthen exchanges and deepen cooperation. Only then we can find the opportunities and seize them. Only then we can write a new chapter for China-UK financial cooperation and contribute more "golden fruits" to the "Golden Era" of China-UK relations.